Big photo prints make great, unique Holiday gifts! If you’ve been thinking about buying a Photo-John Fine Art print, now’s the time. For the next few days I’m having a Black Friday / Cyber Monday Holiday Fine Art Photography Sale. All prints 11×14 and larger are on sale for 20% off, through the end of November*. That includes panoramics and canvas wraps. Use the code HOL20 at checkout to apply the Holiday discount to your order. Click on any photo in the sample gallery below to order a print; or go directly to the Photo-John Fine Art Print Store to see all Photo-John Fine Art landscape, mountain bike and ski photos. If you don’t find what you want in the store galleries (maybe you’ve seen something on my Facebook, Instagram or Flickr galleries), contact me and I’ll see what I can do about getting the photo you’d like added to the Fine Art Store. Alyson’s family got her this 6-foot panoramic canvas wrap for Mother’s Day. Learn more about it, here. 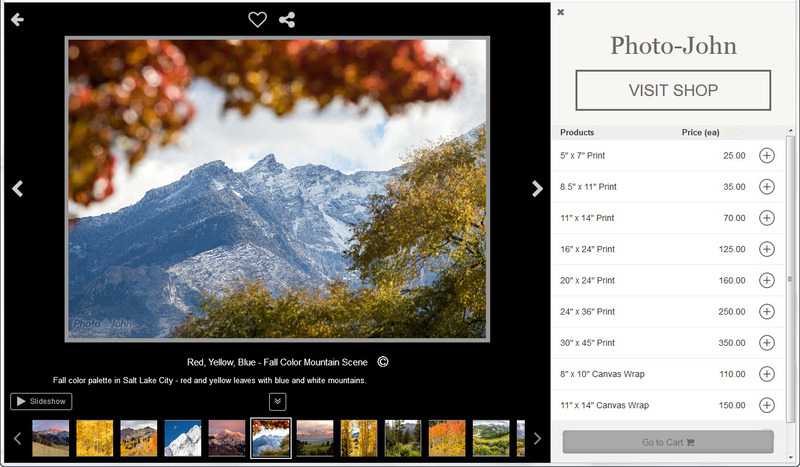 Here’s a screenshot of a photo in the Photo-John Fine Art Print Store. To purchase a print, choose a print size to the right of the image to add it to your cart. For more print options, click on the Visit Shop button above the Products list. Don’t forget to enter the discount code at checkout. *Fine Print: sale is on prints 10×15 inches and larger. Minimum order (single print price) is $65. Cannot combine multiple smaller prints to reach minimum. Discount does not apply to framing or shipping. Sale ends at midnight Mountain Time on November 30th, 2018.